There’s a story behind the name of every locale in Douglas County, and we are sharing some of them in each issue of UV. Just as it’s virtually impossible to go anywhere in Oregon without seeing a mountain, in Douglas County it’s easy to find a waterway — rivers, forks, creeks and ponds, and all in full flow. Flowing freshwater streams are common to western Oregon counties, especially those that touch the Pacific and especially during November, December and January — statistically, Douglas County’s rainiest months. During those 92 days, the county gets nearly half its average annual precipitation, swelling streams and flows throughout. Most of these runs and branches come with a name. And with a name comes a story, most likely a tale of two centuries. Who did the naming? Or in at least one case, re-naming? When? Why? And who else was involved? Some answers are matters of record. Others are closer to folklore. We did some looking into this via the indispensable volume Oregon Geographic Names and back issues of Oregon Historical Quarterly — which has been publishing since 1898. We also looked at other online historical documents. The source of the North Umpqua lies at 5,998 feet elevation on the Pacific Crest of the high Cascades. Part of the Mount Thielsen Wilderness and just north of the mountain itself, Maidu Lake is less than a mile west of the crest and the Klamath County line, near the easternmost tip of Douglas County. It is also the eastern terminus of the North Umpqua Trail. The lake covers 20 acres and has an average depth of 12 feet. From this elevation, the North Umpqua flows 106 miles to confluence with its southern counterpart near Roseburg. The distance includes an elevation drop of more than a mile over its course. The source of Maidu Lake’s name is fuzzier, however. The lake’s name is apparently derived from that of a native tribe that roamed what is now central and northern California and whose northernmost- known lands were near the Feather River and in the Sierra Nevada. That is, according to a 1997 article in the Journal of California and Great Basin Anthropology (Yes, such a publication exists). How the name came to be applied to a relatively small lake nearly 300 miles north-northwest is unclear. Near Maidu Lake is Lake Lucile, a slightly smaller tarn whose naming is documented. Clark Stahlman, a U.S. Forest Service ranger, in 1913 named the lake for his daughter, a christening confirmed 60 years later by Oregon Geographic Names. Location: In the high Cascades, about 124 highway miles east of Roseburg and about 15 miles west of Chemult. Elevation: 5,998 feet above sea level. It’s a testimony to the animal’s bountiful populations in pioneer days and its importance to local residents. Two of the Elk creeks are in Douglas County. The best known of the two joins the Umpqua River near Elkton. The city’s town site was surveyed and laid out in 1850 by members of the Umpqua Exploring Expedition, which had set out from San Francisco in July of that year to take a look at the region with the idea of later ferrying in settlers, which it later did. Elkton was incorporated in 1948. The first-known published mention of the name, however, is in the diaries of John Work, a Hudson’s Bay Co. factor who visited the area in 1834 and whose account of the visit is reprinted with annotations in the September 1923 issue of Oregon Historical Quarterly. His company later established Fort Umpqua, an early trading post. The “other” Elk Creek is a significant tributary of the South Umpqua, which it joins at Tiller. Where this name came from is unclear, but an Elk Creek post office was established near the creek’s mouth in 1877. The office was moved in 1884 to a location six miles down the South Umpqua by then-postmaster John Perdue, and the locale became known as Perdue. Neither Elk Creek should be confused with Deer Creek, which joins the South Umpqua even further downstream near the place that later became known as Roseburg. Location: In northwest Douglas County, the creek is a tributary of the Umpqua River, which it enters at the city of Elkton, 37 miles north-northwest of Roseburg on Oregon Highway 138. Location: In southeast Douglas County, this Elk Creek (above photo) is a tributary of the South Umpqua River, which it enters at the unincorporated community of Tiller, 23 highway miles east of Canyonville. Originally known unofficially as the East Umpqua, the Little River is half of what became known as the “Colliding Rivers,” a nearly head-on crash of water where the Little meets the North Umpqua at Glide. The unusually straight angle at which the rivers meet give the feature its sobriquet. Unlike its name, the Little River is hardly diminutive and, in size and volume, nearly equals the North Umpqua, with which it collides. The river rises near Quartz Mountain and flows about 30 miles before its inevitable collision. Its name does not refer to its width, length or volume, however, but to the birthplace of Meshek Tipton, a pioneer who filed donation land claims on the area in 1855. Tipton had emigrated from the Little River region of East Tennessee and changed the name of the East Umpqua to the Little River in honor of the home he left behind. 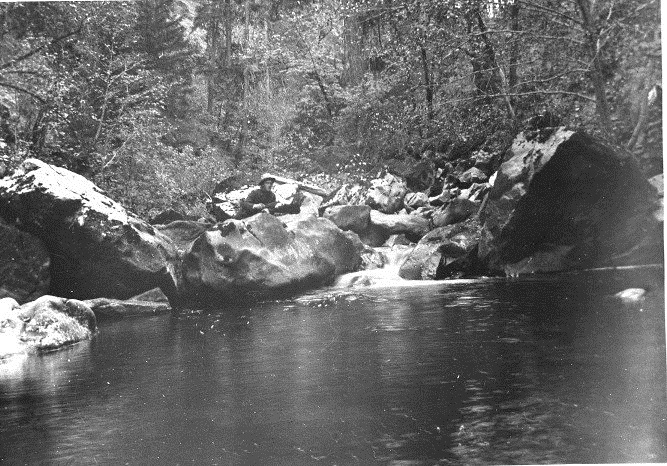 Location: One of the two "colliding" rivers that meet at Glide, the Little River's source is near Quartz Mountain in the Umpqua National Forest.